Herman Wouk’s A Hole in Texas (2004) begins with an author’s note: “At rough guess, 99.9999% of all Americans don’t know what the hell a Higgs boson is” . The percentage may be comparable today, but thanks to the well-advertised discovery of the particle at the Large Hadron Collider (LHC) in 2012, a large percentage of the general public will have at least heard of it. Unfortunately, hearing about a scientific discovery doesn’t necessarily make it less scary. Quite the contrary, in some cases. Various subatomic particles have made guest appearances in popular culture for decades. For example, in the 1964 episode of The Outer Limits “Production and Decay of Strange Particles” the introductory narration invokes the “strange world of subatomic particles”, including “anti-matter composed of inside-out material, shadow-matter [neutrinos] which can penetrate 10 miles of lead shielding. Hidden deep in the heart of strange new elements are secrets beyond human understanding. New powers, new dimensions” . 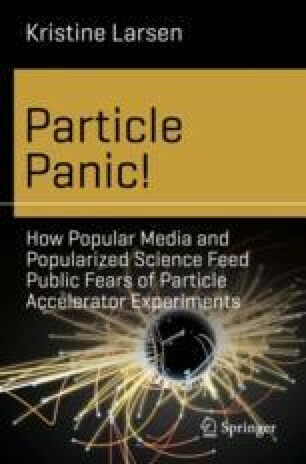 In this chapter we will embark on a whirlwind tour of both the basics of particle physics and the enormous, complex machines used to test its predictions, including the possibility of “new dimensions”. The interested reader is encouraged to consult the works referenced in this chapter if a deeper dive into the physics is desired.